So, following a 2011 UK tour from Bassnectar (the first in 7 years), The Glitch Mob also return to the UK this weekend. 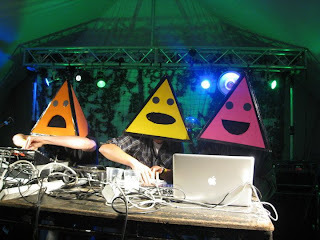 With dubstep getting ever more US sounding (Flux Pavillion, Doctor P), a jaw dropping EP from Zen Death Squad this summer (pictured above) and an amazing forthcoming tune from Koan Sound on Zane Lowe's playlist this week, the time feels ripe for UK Glitch Hop to blow up in 2012. With heavy props from the likes of ill.Gates, Ben Samples and Muti Music boss Dov, this is my EP of the year so far from London's Zen Death Squad. They've just completed a US tour and have a new release on the boil. Inaudible from Birmingham has been pretty audible in the glitch hop community, comes highly recommended from Doktor Krank and has even remixed Freddy Todd and Splatinum. It's 1am on a school night, so I'm bound to have missed about a million people off the list. If I have post your tunes here!